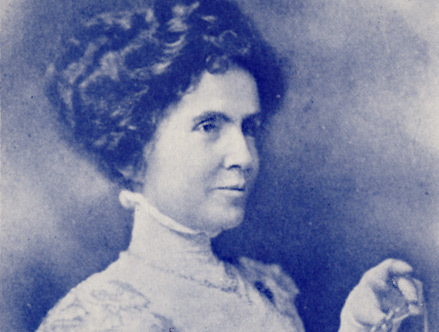 Mrs. Ida E. S. Noyes, a member of Chicago Chapter, Daughters of the American Revolution, was twice honored with the office of Vice President General by the National Society, 1910–1912. Mrs. Noyes spent her girlhood days in Iowa; her father was a doctor in the village where the family lived; later she attended Iowa State College, where her future husband, Mr. Noyes, was also a student. Here she learned to think and act with clearness and accuracy; to these two attributes was due much of the power she possessed for leadership. During her college days she was a good presiding officer and a fluent speaker, talented in reading and speaking. Literature was her chosen field, books she knew well, but her love of pictures and paintings led her to definite study of that form of art, and for several years she was a student in the Art Institute of Chicago and of the Julian School in Paris. She was original in her tastes, beauty alone determined her choice. Her association in later years with the Daughters of the American Revolution gave her a wider sphere for her talents. Mrs. Noyes passed from earth during the month of December, 1912. Her cheery nature and constant smile were hers until the golden cord was severed.